Chesapeake Urology welcomes you to our FREE educational seminars and support groups. 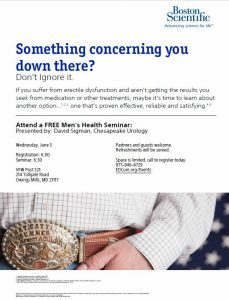 Chesapeake Urology welcomes you to join us at our FREE educational seminars and support groups. Registration is easy — simply call the telephone number provided to reserve a spot. Please feel free to bring a guest or two. Light refreshments are served. To register, please contact Phil Shulka by e-mail at pshulka@cua.md, text or call cell at 443-854-1200. Please email Sara Dennin at sdennin@chesuro.com to register. 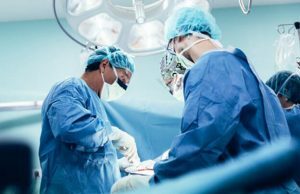 We will be discussing the range of treatment options available for BPH including the proven, minimally invasive UroLift® System procedure. Please RVSP by calling 1-800-343-3503. You are welcome to bring a guest to this informational session. Please register to ensure adequate seating. Light refreshments will be served. diVa Spring Soiree – Join Us! Karen Elizabeth Boyle, MD, a leading urologist and female sexual health specialist, and Sondra Beth Barker, CRNP, MS, RN, a women’s health nurse practitioner who specializes in urogynecology, will share information and insights about diVa, the quick, comfortable, no-downtime solution to a woman’s most intimate challenges. 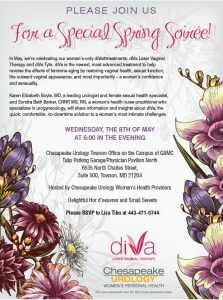 Hosted by Chesapeake Urology Women’s Health Providers. Delightful Hor d’oeuvres and Small Sweets provided. To register for this event, please call 1-877-846-6729, or register online at EDCure.org/Events.